I always know I am going to get more than I bargained for when I read a Mike French. He has this habit of making you send your grey cells on a never-ending obstacle course. Nothing is what it seems and everything is possible, even the unimaginable with French’s speculative fiction. This time he has upped the odds by collaborating with the innovative and creative illustrator Karl Brown. 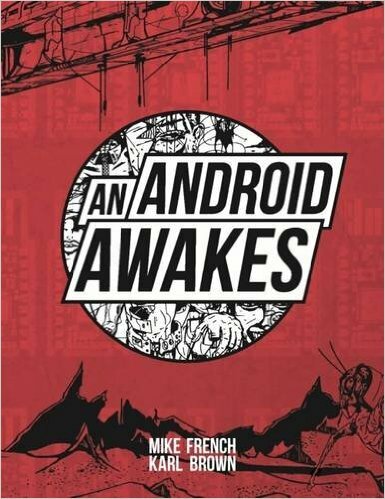 Today’s blog post features a fantastic Q&A with Mike French and Karl Brown and my review of An Android Awakes. Android Writer PD121928 is part of the Android Publishing Program. To replicate a writer’s life, his wife has been forcibly removed and he lives in solitude with an allowance for drugs and state prostitutes. Having just had his novel The Eating of Citizen Kane rejected, he now has 14 more attempts to get a story accepted for the program or he will be deactivated. Can one of his characters and their story save him? Connect, discuss, chat and comment on #AnAndroidAwakes at anandroidawakes.com or facebook.com/AnAndroidAwakes or on Twitter. Mike: John Steinbeck’s The Pearl – I read it at school but enjoyed it again recently on my Kindle. Karl: Last book I read was Watchmen by Alan Moore and Dave Gibbons. The last movie you watched, which you felt left a mark (in your heart, soul, wallet…you name it)? Mike: Chappie – A Xmas present – loved it, especially as in all good sci-fi it makes you question the nature of your own existence. I liked it when Chappie, who is an android, says, “You’re my maker. Why did you just make me so I could die?” Great line and yeah it makes you think. Death is cruel – if I ever meet him I’m going to give him a damn good kicking. Karl: Recently saw Star Wars The Force Awakens. Cried about five times. Was awesome! Are you more of a Game of Thrones, Die Hard or Walking Dead kind of guy? Mike: Die Hard – I grew up in the eighties so that gives it the edge for nostalgic reasons. Karl: Die Hard. I’m drawing far too much to invest in WD or GOT. What do like to do when you want to relax? Mike: Listen to music – anything from Blur to Pink Floyd. Karl: I stick on a film, podcast or music and have a pen, pencil and paper and then I am good to go! That’s my idea of calm. Which famous person (dead, alive, barely kicking) would you most like to meet? Mike: Leonardo da Vinci – can’t believe how he managed to be good at so many things – fascinating person. Karl: I would like to meet H.R. Giger. His life seemed to be a struggle to get his vision of the Universe out of his head into his paintings. Mike: Ben & Jerry’s Phish Food. All of the above questions are actually a pretty elaborate pysch evaluation disguised as random questions. Have no fear here come the real ones. Let’s talk about An Android Awakes. I just have to know whether this story started out in your head, as a kind of tongue in cheek view on the life of a struggling author? Or did it develop along the way? in which Scheherazade tells stories to captivate King Shahryar to save her life. So I used that as a framework to explore the life of a struggling writer. In AAA the android is Scheherazade, its submissions are equivalent to the stories she tells and King Shahryar is the personification of the publishers and agents. The android even says it feels like Scheherazade at one point and, like her, it has the threat of death hanging over it. It might seem like a cliche, and I know most authors put a part of themselves in their books, but An Android Awakes appears to give a particularly deep insight into your thoughts and experiences as an author. Would you agree? Mike: Yes and the rejection letters it receives are the actual rejection letters I received when I was first starting out – so literally a case of taking a painful experience and turning it into art. Any system or structure in society eventually becomes corrupted and morphs into an unassailable entity in its own right devoid of compassion and emotional intelligence – the publishing world is no different. There are some amazing and wonderful and passionate people who love literature in publishing but they are stuck in the system and the system is a monster. One of my favourite submissions is Submission 31 Bookmark. Do you believe this is where technology is headed, devices making our reading choices and selections, as opposed to humans picking of their own accord? Mike: Yes of course, but it will probably be more subtle than that. So for example how much of our choices reflect who we are as a person and how much is influenced by the society we find ourselves in? The latter can be manipulated to generate a desire and appetite to consume things that we think we want, but in-fact we have been conditioned to think we want. As technology becomes more and more integrated into our society, especially with highly personal interfaces like social media, our ability to make real choices from everything from what book to read, to how we think about politics becomes eroded until we are left with the illusion of choice. Automate those processes and suddenly we are in trouble with the machines in control. Do you feel as if the book industry already sways our choices in a detrimental way? Mike: Yes and from our vantage point with AAA it has been fascinating. Some of our experiences of getting AAA into physical stores have been encouraging and we are in Forbidden Planet and some key Waterstones stores. With others though, it has been very disheartening. For example, one buyer from a major chain said, that the concept of AAA seemed very original and was almost like Hunter S Thompson mixed up with Blade Runner or 1984. But went on to say that, unfortunately high concept titles like AAA often struggle in their stores and that the majority of their customers were more casual browsers and stuck to what they already knew. So why is that? Who is feeding that bias towards banality? It’s the retailers and the book industry that has fostered and encouraged it. Is An Android Awakes the voice of future publishing or is it the voice of present publishing wrapped up in a futuristic scenario? Mike: It’s a possible future if we carry on as we are. The publishing industry is not as bad as portrayed in AAA – but that’s the road it’s on. With that in mind is the accepted submission also indicative of mainstream publishing at this moment in time? Mike: Yes, it’s almost impossible to get something accepted and I was very lucky to get picked up by Elsewhen Press. The last submission the android sends is very close to an actual submission sent to a publishing house. The Telegraph ran a story on it a number of years ago. I won’t give away what that submission was here (spoilers!) but that writer got a standard rejection letter sent to him – read the android’s version in AAA and you will see how ridiculous that was. In fact it showed that the submissions were not being read at all. I know what my perception is of your collaboration, what I would like to know is how you perceived it. Do you feel as if the two of you and your talents fit together like a glove to hand or was it more of a tempestuous melding of two minds with the ability to think beyond the box? Mike: Both! In that we both have similar tastes and spend many an hour chatting about our love of similar films and comics like Watchmen in coffee shops. So the look of AAA is something that does fit very well into the aesthetics of how I wanted the world of AAA to be. However we are also very different people and think and process things completely differently. So it’s been interesting to learn how to work together – I think the overall feel of AAA is a reflection of both of those dynamics. Is it easier for the reader to envisage your ideas using illustrations or actual imagery of your concept, especially because your fiction is speculative? Mike: It really depends on the reader. I think the main advantage of having a high amount of illustrations in AAA is to help heighten the overall tone of the work and to elevate the physical book into something that becomes a piece of art in itself. What I would really like to know is whether you read the book or chapters and came up with the illustrations or did Mike give you a general idea of what the illustrations could/should look like? Karl: Process of my working relationship with Mike was a simple one. We sat down in a room, we picked a story and as Mike read, I sketched whatever I had in my head for that part of the story. It would be a rough sketch – the final images took a lot more concentration. Which story element of An Android Awakes do you think is best represented in your art or illustrations? Karl: I think the story of Able Ford. It just seemed like a really tragic story. The character creation process of the Priest and Able was a very detailed and exciting one – mainly because the Priest is so creepy looking whilst Able in contrast has a certain sensitivity to him. Was there any particular inspiration for your drawings other than the original source, the book itself? Karl: My Inspiration was very much from all the research I put into it. From looking at documentaries based on Moebius the French Artist to reading Heavy Metal Magazine and 2000AD. It just seemed that AAA’s collection of characters existed in a similar universe to these, so that’s how I produced them. Karl: I think we thought that when we started we would just work together a few hours a week and maybe if that had of happened AAA would have remained a pipe dream. I think we worked so well together, even though there is a massive age gap, because we had a determination to make a career and living from doing what we love the most. And also Me and Mike have not only got a good working partnership but a great friendship. Will there be more collaborations like this in the future? Karl: Yes, AAA is our first produce of what I think will be a long relationship and we started working on a project in January called Non Stop Till Thought Bubble. This will document our journey to presenting work later this year to the No.1 in British comics: 2000AD. When you read a Mike French you have to be prepared to think beyond, above and way ahead of the box. He is great example of speculative thinking/fiction. In An Android Awakes he combines sci-fi, futuristic scenarios, psychology, and his special brand of sarcasm. In this book he is also quite astute when it comes to viewing the plight of aspiring scribes. This time French has joined forces with illustrator Karl Brown to create the perfect blend of imagery and story. The fascinating thing is that the two are completely separate entities, both the pictures and the words tell different stories. To me it felt as if this was an in-depth look into the psyche, struggles and life of every author vying for their piece of the literary pie, albeit in a futuristic setting. The struggle remains the same, in fact the author pretty much has the desperation and frustration down to a fine art. One submission and rejection after the other with Android Writer PD121928 trying to create to perfect story. In the end the irony of what the powers that be want is possibly the same as selling your soul to the devil. Giving up creativity and freedom for acceptance and popularity. In a sense that is what many authors are confronted with nowadays. Do they conform to the mass thinking of popular genres and plots or do they go with their own particular brand of creativity? My favourite submission is 31 Bookmark. I thought it was innovative and completely creepy at the same time. I can see this being a thing of the future. French might want to patent that idea. I look forward to seeing and reading any future collaborations by the the two of them or indeed any individual work. I would like to say a big Thank You to Mike and Karl for answering all of the questions even the odd ones. I hope you take a look at this innovative collaboration and enjoy it as much as I did. Buy An Android Awakes at Amazon UK or go to Goodreads for any other retailer. This entry was posted in Dystopian, Futuristic, Genetics, Speculative Fiction and tagged An Android Awakes, Android, Futuristic, Karl Brown, Mike FRench, Sci-Fi, Speculative Fiction.